LAS VEGAS (AP) — President Donald Trump and first lady Melania Trump met privately with victims of the Las Vegas shooting at a hospital Wednesday, praising them and the doctors who treated them as he visited a city still reeling from the worst gun massacre in modern U.S. history. He also met with first responders who'd been on duty Sunday night, telling them: "You showed the world and the world is watching, and you showed what professionalism is all about." Air Force One landed at the airport near the famed Las Vegas strip on a bright, sunny morning just days after a gunman on the 32nd floor of a hotel and casino opened fire on people at an outdoor country music festival below. The Sunday night rampage killed at least 59 people and injured 527, some from gunfire and some from a chaotic escape. Speaking to reporters from the lobby of the University Medical Center lobby, Trump said he'd met "some of the most amazing people" — and had extended some invitations to visit him in Washington. Trump then headed to the Las Vegas Metropolitan Police headquarters, where he met with police officers, dispatchers, and others who'd responded to the shooting. On his trip from the airport, the president's motorcade drove past the Mandalay Bay hotel where the gunman fired down into the concert crowd. 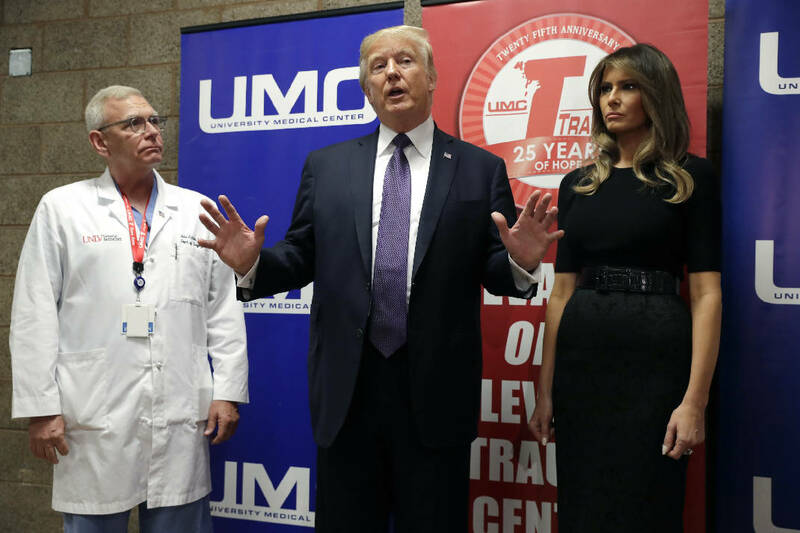 Throughout the visit, Trump focused his remarks more on praising recovery efforts -- commending doctors and first responders -- than on grieving the dead. "It's a very sad thing. We are going to pay our respects and to see the police who have done really a fantastic job in a very short time," Trump told reporters before departing the White House. "It's a very, very sad day for me personally." The president also drove past his own Trump hotel. Trump's trip to Las Vegas follows his Tuesday travel to hurricane-ravaged Puerto Rico — a pair of back-to-back episodes that are testing his ability to unite and lift the nation in times of strife. Trump, a leader who excels at political provocation and prides himself on commanding strength, has sometimes struggled to project empathy. Trump told reporters Tuesday night that his trip would include spending time with "some of the folks that are recovering, some of the survivors," and seemed emotional as he spoke about the human toll. "We're going to be seeing - ah it's a very, it's very, it's a very - horrible thing, even to think about. Really horrible," he said. "We're also meeting with the police, the sheriff, and we're going to spend quite a lot of time in Las Vegas." Trump was also joined on the trip by House Majority Leader Kevin McCarthy and Nevada Republicans Rep. Mark Amodei and Sen. Dean Heller.